While transitioning from youth to adulthood, Cleve was drafted by the Army to fight in Vietnam. When given the opportunity to serve his country, he did not shrink away from his responsibilities. Our country’s freedoms were worth fighting for, and he served with pride. Cleve pursued an associate degree from Wayne Community College once he was released from military duty. Upon graduation, Hevi-Duty scooped him up, and the Goldsboro facility has housed his work family ever since. 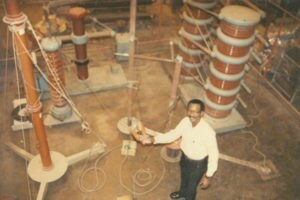 November 6, 1968, marked the beginning of Cleve’s journey with SPX Transformer Solutions (then Heavy-Duty Electric). 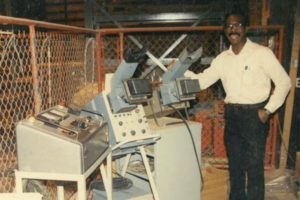 Starting in the Test Department as a tester, Cleve was promoted over the years to the positions of test technician, test supervisor, test engineer, and, finally, to his present position as product test supervisor. Cleve has received many awards and recognition for his work performance. Even customers have extended their compliments in writing, for the knowledge, professionalism and warmness Cleve exhibited to them while visiting the Goldsboro plant. The “Winner’s Award,” a Hevi-Duty company award, was given to both Cleve and co-worker, Major Strickland, in March 1987 for their above and beyond contributions. The customer was Corning’s Cornelle Ware, and the critical delivery problem was for a large and complex power supply designed to control the temperature and power to a glass melting furnace. The testing cycle was further complicated by the impending test cycle. Through that challenging ordeal, Cleve and Major worked extra hours to prepare the lengthy part listings and drawings, minimizing both engineering and manufacturing time. Both worked nights, weekends and holidays and, as a result, the power supply shipped on time, requiring only five hours of customer witnessed quality assurance testing. Corning Glass was elated, and Cleve and Major were rewarded. From farm life to a successful manufacturing career all these years later, Cleve has certainly seen the world change drastically. Technology has evolved beyond any of our expectations, and, yet, throughout all the changes, Cleve remains constant and consistent. His passion, dedication and technical expertise have never waned. Thank you, Cleve, for your loyalty, hard work and perseverance — then and now.